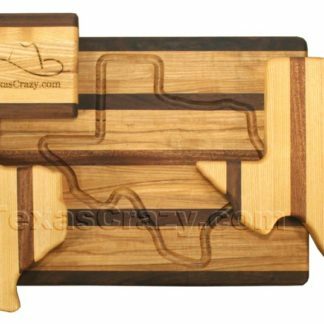 Celebrate the lone star state with a Texas map hardwood cutting board from our Texas Kitchen collection. Features a Texas map outline drainage channel for preparing meats (knife in picture is not included). Or use the smooth reverse side for slicing up salads, cheese, or bread. Durable hardwood for long lasting use under normal conditions. Easy cleanup with soap and water. Measures about 13 x 16 inches. Because this board is so pretty, it makes a great Texas kitchen accent when dinner preparation is done. These hardwood cutting boards are custom handcrafted of genuine hardwoods, so each board is unique. Made in Texas. Here’s some information on Texas Cutting Board Care. If you are looking for the perfect thank you gift for that Texas meeting attendee or speaker, we can laser engrave your company logo on the wooden cutting board top (see Company Logo Cutting Board Engraving below). In Stock. Usually Ships in Two Days. Please call on timing for large orders.